How SBI's Green Channel Banking works..
State Bank of India (SBI) launched Green Channel Banking (paperless Banking) at select branches some time back. SBI's Personal Banking Branch at Goa-ves Belgaum is now providing the service to its customers. 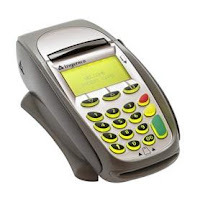 A POS (Point of Sale) machine (similar to the one seen at Shopping Malls) has been placed at desks. The customer swipes his Debit Card and is offered three choices: Cash Withdrawal, Cash Deposit and Funds Transfer. Using the Cash Withdrawal option, he can withdraw more Cash than he can at the ATM. Also, unlike the ATM, here he can choose the denomination of notes.Similarly, he can deposit Cash using the Cash Deposit option. I tried out the Funds Transfer option. On selecting the option, I was asked to input the beneficiary's Account number. The system showed me the beneficiary's name and asked me to input the amount to be remitted. I was also asked to authenticate the transaction by inputting my Debit Card PIN(Personal Identification Number). On successful authentication, a message popped-up on the Bank official's screen. On his confirming the transaction, the transaction was completed and a receipt issued showing all details of the transaction. There are no charges for use of the facility.
" Using the Cash Withdrawal option, he can withdraw more Cash than he can at the ATM." : I doubt if this is true . (within the daily limit) at the POS Machine. Only 5 cash deposit is free in green channel in one month . for more then 5 , rs. 57 will be charged for each deposit .